You are here: Home / Shopping Brags / Another Walmart Trip! So, I got a few more things at Walmart today! I got 20 Louisiana Hot Sauce – used the $1/2 from the 1/16 Smart Source. 4 Snuggle Dryer Sheets – used $2/2 from the 1/16 Smart Source. See all this week’s WalMart Deals now! Don’t want to miss anymore great deals? Subscribe to Grocery Shop For FREE, it’s FREE! Follow me on the Grocery Shop For FREE Facebook Fan Page! Check out the Penny Pinching Bargain Bunch for more deals like this! Great job! 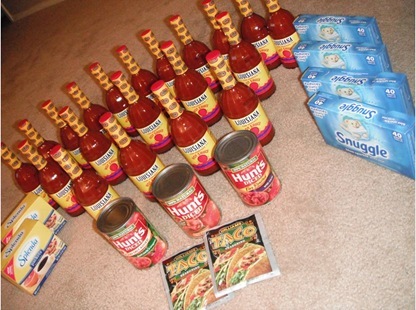 What in the world are you going to do with that much hot sauce? LOL. @Kristi at Spend Less and Save More: Ha Ha thanks! You have no idea how many people “shop” in my stockpile!! lol Anything left that we don’t use will go to the shelter! Not to second guess any Mom but did you think of how your son felt having his photo taken at his age with a ton of Kotex in front of him. @Linda Maness: Well, get with the program! Today is the last day you can buy coupons from last Sundays paper! They will switch them out tomorrow early! i didn’t buy the paper this week. but i did get 3 Smart Source papers from the Wednesday paper, i wander if they are in those? im gonna look and see..lol I just have to much going on!.. @Shelly @ Coupon Teacher: Thanks Shelly! I see that you mentioned something about buying coupons, could you please clue me in on how to do this. I have no Idea what to do! Also, you can search for Coupon DeDe and she has a coupon clipping service you can use. You just register and choose your coupons and they mail them to you once you have paid.